There's much to be said for 'various artists' compilations. Some artists, of course, are condemned to perpetual 'various' status, because they simply didn't record enough to justify their own modern reissue. Some 'one-off'' classics should be included in as many compilations as possible, just to make sure they get heard now and then. But that isn't the only benefit of such endeavours. Those of us born into the era of the long-playing record are spoilt. We can't be reminded too often that our pre-WWII heroes did not make their records to be played a dozen at a time in quick succession. What a pleasure it is, suddenly to hear an old favourite in its more natural context, alongside its contemporaries. Two good examples, which leap out of Volume 1 of this collection, are Lemon Jefferson's One Dime Blues and Blue Harvest Blues by Mississippi John Hurt. Both sound great, and not just because the sound quality itself is up to current standards. In the days when relatively few pre-war blues artists had been systematically reissued on LP, Yazoo produced some of the most attractive and extensive compilations, sampling the 'legendary' alongside the obscure. Now that the 'race' catalogues are generally available, the company is doing a similar job on the 'country' & 'hillbilly' material of the same period. This inadequacy is compounded by the fact that the booklet covers both CDs, which must be pretty irritating for someone who's just bought one volume. It's a clumsy and unsatisfactory compromise between two self-contained volumes and the single two-CD set they might have made. In either case, simple, clear recording details would have been preferable, but that is something Yazoo have never gone in for, even when they have provided detailed musical analysis (which they haven't in this case). Perhaps the train-spotter approach is a European taste. If some people were like me, they'd a-been poor when times was good. Volume 1 kicks off with two obvious choices - obvious, because they're familiar but couldn't be more right. Down On Penny's Farm by The Bentley Boys is familiar from Harry Smith's Anthology, but I think this is the first time I've heard it on CD. That's followed by Alfred Reed's How Can A Poor Man Stand Such Times and Live, which is welcome whenever it appears. 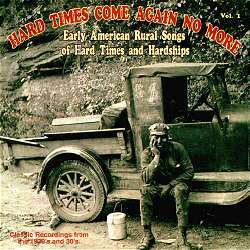 Demonstrating the scope of the collection, these two hillbilly classics lead into Hard Time Blues by Lane Hardin, an excellent bluesman I'm not aware of ever having heard before. Volume 2 opens in very much the same way. 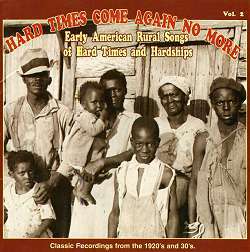 Hard Times down on the farm is the theme of the Allen Brothers' Price of Cotton Blues, and their instrumentation also echoes their counterparts on Volume 1 - if, as I suppose, the Bentley Boys used a tenor banjo. Alfred Reed's place is taken by another fiddle-guitar piece, Keno the Rent Man by Paul & Leon Cofer of The Georgia Crackers, and they're followed by fellow Georgian 'Barbecue Bob' Hicks. Both Hicks and the Cofer Bros. also appear on Volume 1. The two earliest recordings here (as far as I know) were made in 1924, and both appear on Volume 1. Fiddlin' John Carson's marvellous Dixie Boll Weevil is typical of his early, solo, recordings - majestic, yet you can hear the grin. If Carson might be called the first hillbilly recording star, Samantha Bumgarner has a claim to being his female counterpart. Described by Wolfe as 'probably the first woman instrumentalist to record old-time music', she was previously known to me as the first person Pete Seeger ever saw play the five-string banjo. She sings Georgia Blues very prettily, in a high, sweet voice, accompanying herself in a sprightly manner. The cover of this compilation claims that it includes artists 'never heard before on any reissue', without any indication of to whom this applies; I can only assume that Bumgarner is one of them. She crops up elsewhere in Yazoo's reissue programme, so her recordings should become better known. Another solo performer whose acquaintance I'm pleased to have made is Frederick 'Chubby' Parker, of Kentucky, whose 1931 recording of See the Black Clouds a-Breakin' Over Yonder appears on Volume 1. It's a splendidly rumbustious, minstrel-style piece, accompanied on banjo & harmonica. Inevitably, perhaps, some of the least familiar items are the less conspicuously rural ones. The long-established interaction between native country music and professional showbusiness (not to mention the important influence of Hawaiian music) is demonstrated by another 1931 recording, also on Volume 1. Bernard 'Slim' Smith's jaunty Breadline Blues includes a verse on harmonica, but is otherwise accompanied on steel guitar by Benny 'King' Nawahi. Smith is not entirely comfortable with the characteristically sophisticated, swinging accompaniment, but does a good job nonetheless; and Nawahi, of course, is always worth hearing. Similarly, each CD ends with a boldly atypical but entirely suitable example of borderline material. The title track of the whole set, which closes Volume 1, is a sentimental piece written by Stephen Foster in 1854. Like most of Foster's work, the words are somewhat challenging, but the tune is lovely, and the Graham Brothers' conventional vocal arrangement undeniably affecting. As if in response, Volume 2 finishes with Them Good Old Times are Coming Back Again, by Jim Baird, whose real name apparently was Bill Elliott. We're told that nothing else is known of him, and I have no idea whether he supplies the startling organ accompaniment. Nineteenth-century pop songs are not the only representatives here of hard times preceding the depressions and depredations of the twentieth century. It's worth mentioning (since I've been known to complain about the common prejudice against such material) that there are also two examples of what are usually called cowboy songs, though they have nothing to do with herding cattle. In fact, they're excellent, ironic accounts of hard times on the western frontier. Volume 1 includes Edward L Crain's 1931 recording of Starving to Death on a Government Claim, also known as Lane County Bachelor. Volume 2 boasts Jules Allen's classic 1929 recording of Little Old Sod Shanty, the well-known western parody of Little Old Log Cabin in the Lane. Apart from Lane Hardin - who may represent a simple oversight on my part - the black artists in this collection are unlikely to surprise any enthusiast, but the examples are all well chosen, and there will be no argument about the quality of artists like Scrapper Blackwell, Blind Blake, Barbecue Bob, John Estes, Peg Leg Howell, Charley Jordan, J D Short and Joe Williams. Particularly well represented is the Jackson, Mississippi gang involving the Chatman & McCoy families. The Mississippi Sheiks are not here, but Volume 2 includes The Northern Starvers are Returning Home by Charlie McCoy & Bo Carter, and Time Is Tight Like That by Bo Carter & Walter Vinson. Best of all, though, is the contribution to Volume 1 by Alec Johnson, the medicine show veteran who recorded six tantalising sides in 1928. On Miss Meal Cramp Blues, he is accompanied by Joe McCoy on guitar, Charlie McCoy on banjo-mandolin and Bo Carter on fiddle. The playing is so lively, and the sound so full, there seems to be a piano in there too (I'm pretty sure there isn't). Perhaps it's unnecessary to point out that the title refers not to some strangely named enamorata, but to the pain that results from missing a meal or five. The song is related to I Heard the Voice of a Pork Chop, and very funny. A couple of mawkish hobo songs (and Stephen Foster) aside, the general tone of this compilation is humorous rather than mournful. Of Lemon Jefferson's One Dime Blues, Don Kent comments: 'Down to his last dime, the singer jauntily buys a daily newspaper and a cigar, symbolising a strain of unquenchable optimism never completely gone from the American character'. This is hardly an original observation, but it remains as puzzling as ever. If all you have in the world will buy you a newspaper & a cheap cigar (or a bottle of booze, or whatever) and nothing else, what on earth would be the point of not buying the cigar? Does this make me an optimist?